Preface. List of Figures. List of Tables. Acknowledgements. About the Author. Microcomputer Architecture. Programming in C and C++. Operating Systems. Bus Hardware and Signals. Parallel and Serial Input-Output. Interrupts and Alternatives. Timer Devices and Time-Sharing. Embedded I/O Device Design. Communication Systems. Display and Storage Systems. Appendix. Index. The "M·CORE" family of microprocessors is the latest 32-bit integrated circuit from Motorola designed to be a multi-purpose "micro-controller." The processor architecture has been designed for high performance and cost-sensitive embedded control applications with particular emphasis on reduced power consumption. This is the first book on the programming of the new language instruction set using the M·CORE chip. 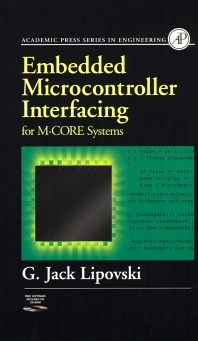 Embedded Microcontroller Interfacing for M·CORE Systems is the third of a trio of books by G. Jack Lipovski from the University of Texas. The first two books are on assembly language programming for the new Motorola 6812 16-bit microcontroller, and were written to be textbooks and professional references. This book was written at the request of the Motorola design team for the professional users of its new and very successful M·CORE chip microcontrollers. Written with the complete cooperation and input of the M·CORE design engineers at their headquarters in Austin, Texas, this book covers all aspects of the programming software and hardware of the M·CORE chip. Electrical engineers and computer engineers in assembly language programming, mechanical and industrial systems, control engineering, and robotics. G. Jack Lipovski has taught electrical engineering and computer science for 30 years. He is a computer architect internationally recognized for his design of the pioneering database computer, CASSM, and the parallel computer, TRAC. He is an expert in microcomputers and is a past director of Euromicro and former editor of IEEE Micro. Dr. Lipovski is the author of nine books, more than 70 technical papers, and holds eight patents in the areas of logic-in-memory integrated circuits. He is a Fellow of the IEEE and a Golden Core Member of the IEEE Computer Society.